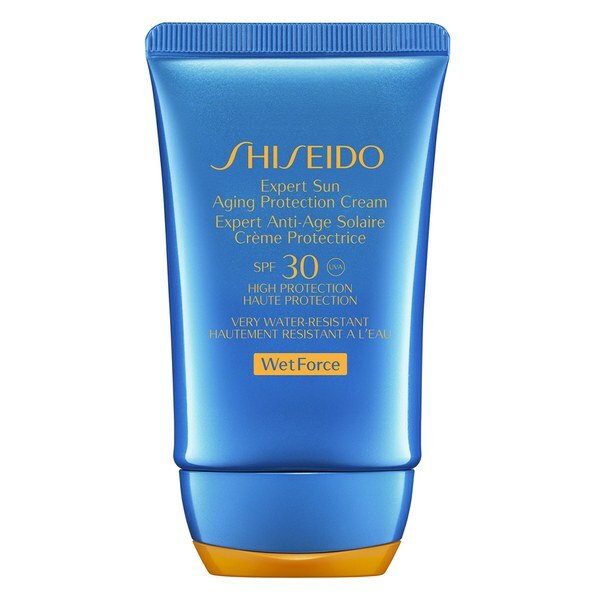 Expert Sun Aging Protection Cream from Shiseido, a brand with a unique WetForce formula to provide UV protection that is boosted by water. 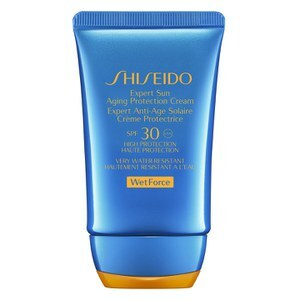 This advanced technology is combined with SuperVeil 360 to create a shielding veil on the skin's surface to prevent unintended burning from uneven sunscreen application. Anti-ageing ingredient Profense Cell gently hydrates skin to reduce dryness, leaving it full of moisture. The Ionic Mineral Sensors contain negative ions to bond with positive ions found in water and perspiration, this forms a water-repellent layer to make UV protection even stronger. The lightweight cream can be used on the face and body and allows you to swim, play sport and sunbathe without sand sticking to you. E.N. Apply liberally 15 minutes before sun exposure. Reapply at least every 2 hours. Not suitable for use on children less than 6 months of age.